maple and shade: Gold gild. Quite possibly my favorite accompaniment to Charleston's balmy summers? Afternoon thundershowers. My work day is winding down, and Maple and I are gearing up for a weekend getaway, but for the moment I'm posted up on the couch, in front of our big, partially open picture window, coffee in hand (of course), watching the rain pour down on my happy front yard flowers...soaking this drizzly weather up as much as they are. I should be taking care of looming chores...like...packing...but I couldn't help but take advantage of this couch-calling rainstorm. 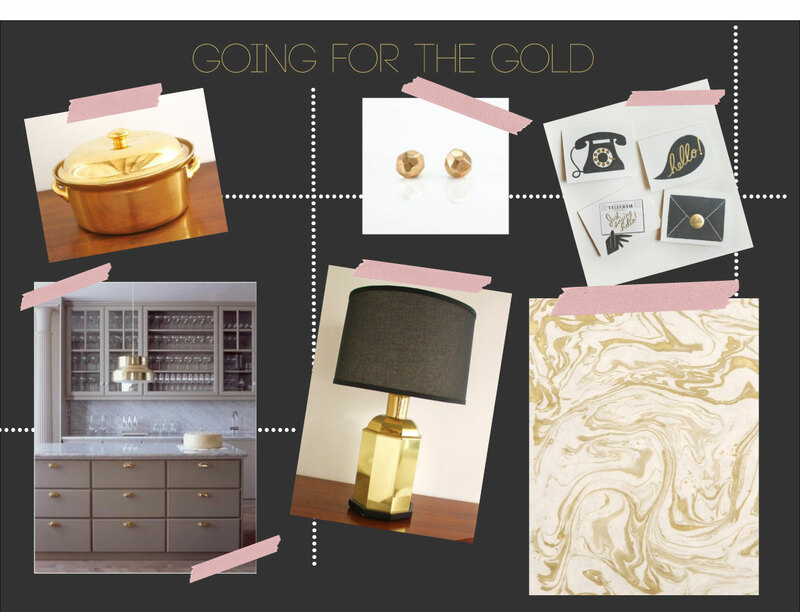 Anyway, here's a peek into what's been inspiring me and my design outputs as of late...I'll give you a hint: it's shiny, ultra-chic, reminiscent of an awesome, vintage era, and working it's way into just about every room in our house...and my client's (don't worry, Williams--not you). Gold casserole dish? Brilliant addition to any dinner party. Shiny-clad calling cards? I say yes. I'll forgive the fact that it's Martha's kitchen that dons gold-plated cabinet hardware...it's amazing. This gold-hued, geometric lamp would be stunning on my (somewhat imaginary) bedroom dresser. Furniture collecting takes time, right? Yes--if you're broke.